My Research is a tool that you can use to save, manage, and organize the content and supporting materials you find and create in ProQuest. You can include documents, searches, search alerts, RSS feeds, and more in My Research. 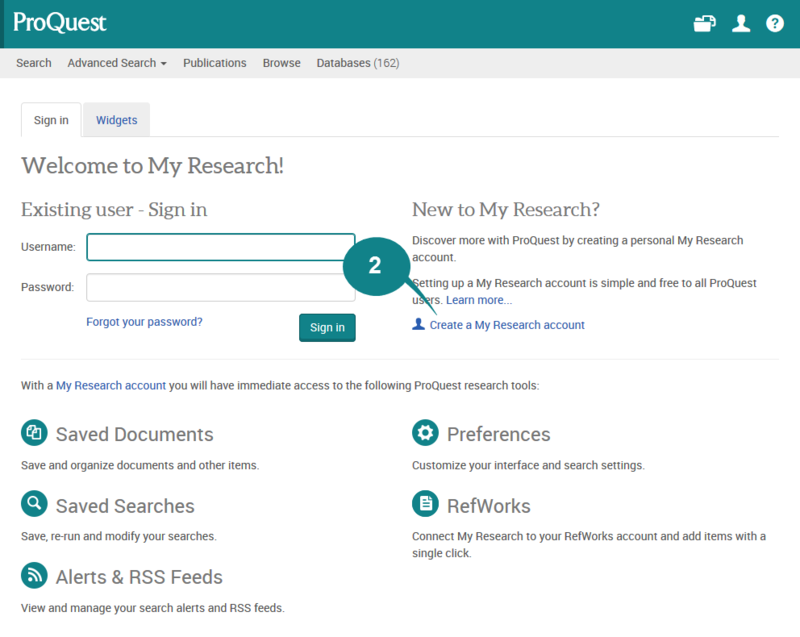 Setting up a My Research account is simple and free to all ProQuest users. 1. Click on the profile icon and select the Sign into My Research link (located in the upper, right-hand corner of any page in the ProQuest platform) to create an account or sign into an existing account. 2. The link to Create a My Research account is to the right of the Sign in box. 3. To create an account, just fill in the required fields: name, username, password, and email address. The RefWorks field is optional and if you have a legacy RefWorks account, you can choose to link your RefWorks account with your My Research account. You’ll need to provide the following RefWorks account information if you decide to link your accounts: log-in name and password. This feature does not work with New RefWorks accounts; it only links with legacy (old) RefWorks accounts. Documents – Save, view, and organize ProQuest documents. 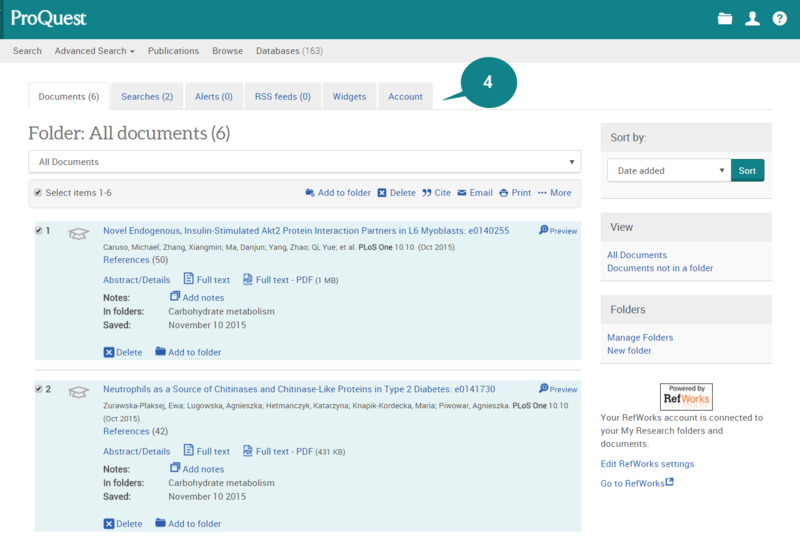 If you have a RefWorks account synced with your My Research account, you will also see your RefWorks records and folders here. Searches – Save searches to provide easy future access to search strategies and results. Alerts – Manage any alerts that you create while logged in to My Research. RSS feeds – Manage any RSS feeds that you create while logged in to My Research. Account – Adjust your account settings and preferences to personalize your ProQuest search experience. One great preference you can take advantage of is to create a short-cut to your favorite databases so that when you login in via My Research, your favorite databases are bundled together and pre-selected for you. Important to know: My Research accounts will be permanently closed after three years of inactivity. Next to the My Research sign in tab, you will also have access to the Widgets tab. You don't have to be signed in to a My Research account to use the Widgets tab. Anyone can create and embed ProQuest search boxes in web pages and subject guides to make new access points to ProQuest.